* Posts may contain affiliate links. Full disclosure here. We chose a stainless steel barbecue tool set for our backyard entertaining. We wanted BBQ utensils that were durable and would give us good service, and we wanted them to look great too. Whether you cook outdoors regularly or infrequently, having quality accessories pays for itself. Your tools look great season after season. You’ll be able to flip, slice and turn with kit that doesn’t affect food flavors, won’t rust or crack, and which over time stays looking as good as new. The bigger sets have a carry/storage case which is great. 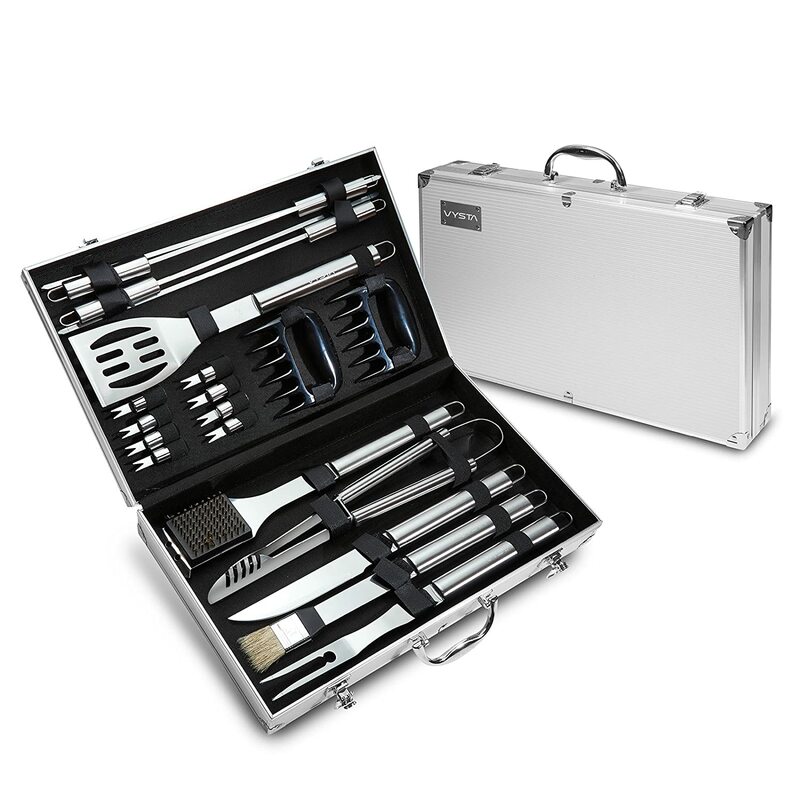 You know that all the essential grilling tools you’ll need are in one place, just grab the case and go. We find that especially useful when we go camping. 18 Stainless Steel grilling tools. 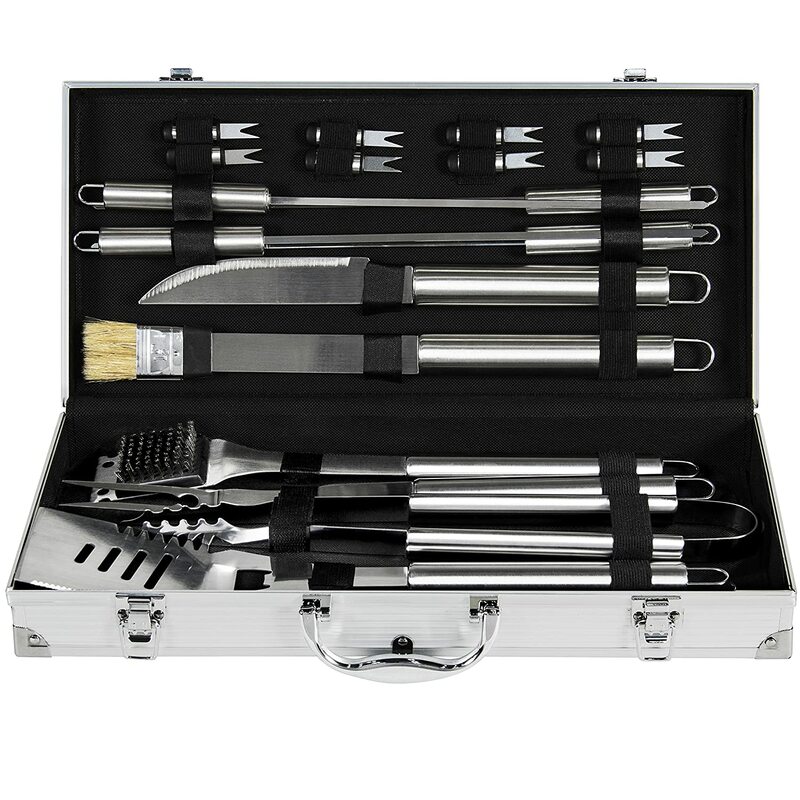 Tools: Spatula, knife, fork, basting brush, tongs, grill brush, 4 x skewers, 8 x corn forks, and aluminum storage case. All tools neatly organized in case. Tools have metal hanging hooks and are dishwasher safe. Tools: Oversize 4-in-1 spatula, fork, tongs, knife, grill brush, basting brush, replaceable head of basting brush, 4 x skewers, 8 x corn forks. Metal hanging hooks for easy storage at grill or in kitchen. Note: The skewers are not designed to be placed on hot grill! 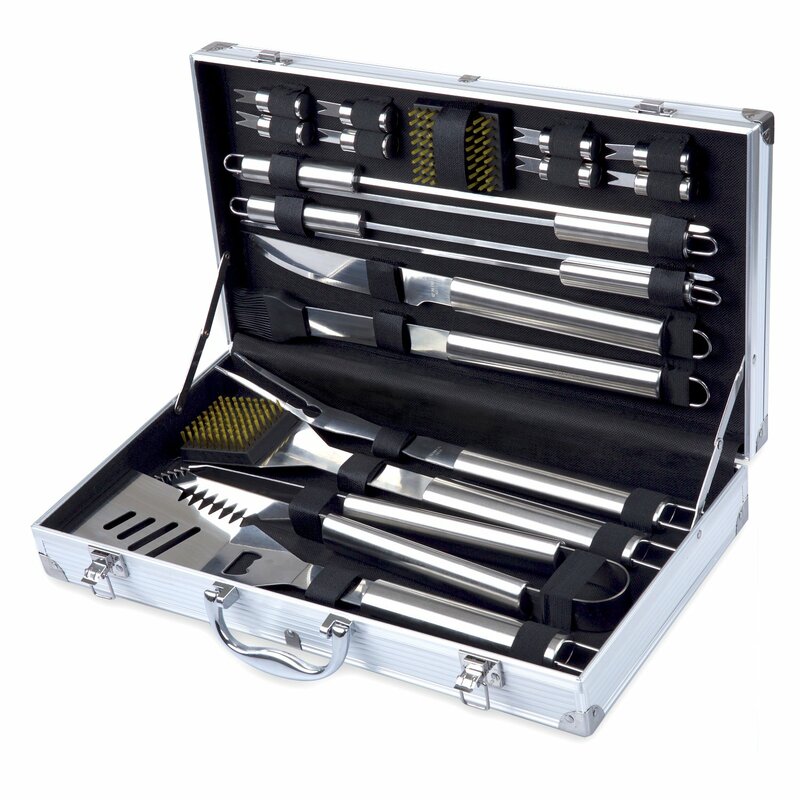 21 piece barbecue tool set from Vysta. Tools are velcro retained in aluminum case. 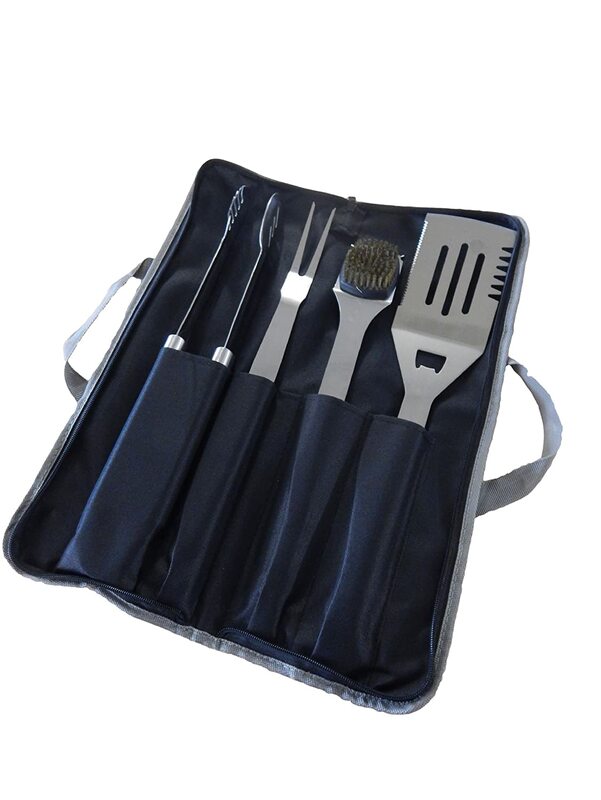 Kit includes: Spatula, tongs, cleaning brush, fork, basting brush, knife, 4 x skewers, 8 x corn holders, 2 x meat tenderizer claws and aluminum carry case. Four piece tool set in canvas, rollup, carry bag with handles. Tools: Spatula with bottle opener, meat fork, grill brush with replaceable head, and food tongs. 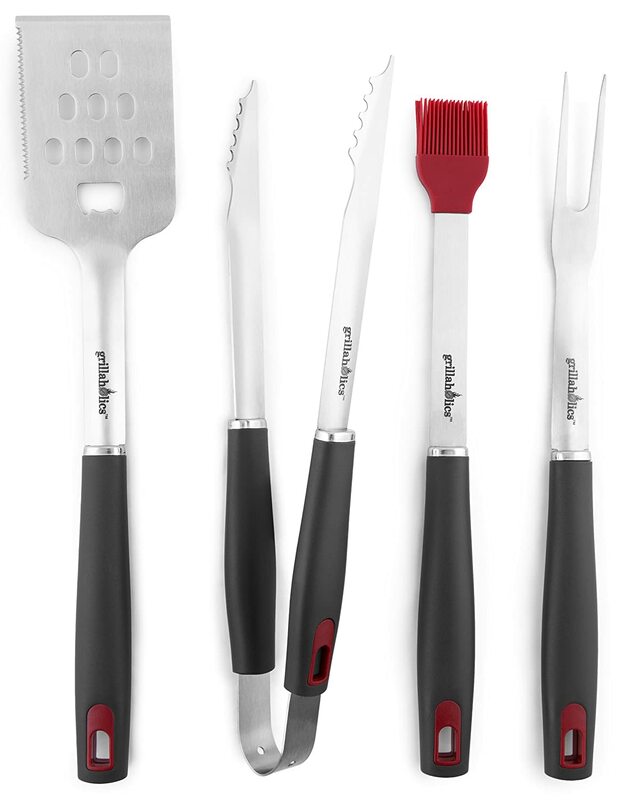 Four stainless steel grilling tools with non-slip plastic handles. Tools: Tongs, barbecue meat fork, silicone basting brush, and grilling spatula that features a bottle opener. Hi. I'm Graham - here with my partner Peta. I'm a backyard and shed enthusiast. 'Glass half full' and 'not growing old gracefully' type of person. Writer, techie and publisher of this website. Welcome! Transform your yard with a small backyard makeover. SmallBackyardMakeover.com is a participant in the Amazon Services LLC Associates Program, an affiliate advertising program designed to provide a means for sites to earn advertising fees by advertising and linking to amazon.com. SmallBackyardMakeover.com also participates in other merchants' affiliate programs and may earn a commission via purchases made through our links. Copyright 2019 Small Backyard Makeover.com All Rights Reserved.